The turkey – perhaps reluctantly – holds center stage in the traditional imagery of Thanksgiving. Of course, stuffing, green beans, mashed potatoes and pumpkin pie play supporting roles in this saga, which rests upon a very profound foundation. But, setting aside for another article the weightier tenets of the giving of thanks and its significance to the human condition, American families should look to the trucking industry as at least one avenue to express their appreciation. After all, without truck drivers – many working on the holidays to enable us to enjoy time with our families – we wouldn’t have the culinary bounty on our tables. The average American eats 16 pounds of turkey a year. Nearly 90 percent of Americans eat turkey on Thanksgiving. More than 46 million turkeys are consumed on Thanksgiving, 22 million on Christmas and 19 million on Easter. Nearly 750 million pounds of turkeys are consumed in the United States annually. Turkey consumption has increased 104 percent since 1970. More than 250 million turkeys are raised annually in the United States. Nearly 50 percent of turkeys are sold in grocery stores, 29 percent in commodity outlets, 15 percent are bought at foodservice outlets and about 6 percent are exported, according to recent statistics. The average Thanksgiving turkey weighs 15 pounds. The largest turkey ever was 86 pounds. We at ABCO Transportation know you get the point. Turkey and Thanksgiving meals are a big deal in the United States. What’s Thanksgiving Without The Sides? But it’s not just turkeys that are being delivered by the truckloads across this county. Consider all of the other food items delivered by trucks that go into the holiday meal. More than 750 million poundsof cranberries are grown annually. Americans consume 4 billion poundsof sweet potatoes every year. How about 40 million green bean casseroles – which required 80 million pounds of green beans – served on Thanksgiving? Sixty million boxes of stuffing are sold during the year, which comes to nearly 23 million pounds. According to Open Road Drivers Plan, more than 65,000 trucks are used to get these sides alone to stores. Now let’s discuss the sweets. Americans consume more than 50 million pies. More than 25 million pounds of pumpkins are needed for the pies. It takes 500 trucks to carry the pumpkins for the pies. All total, nearly 80,000 tractor trailer trucks are required to ship Thanksgiving bounty. That number rises when any extras or non-traditional dinner items are factored into the equation. We say: Happy Thanksgiving and have a wonderful holiday. 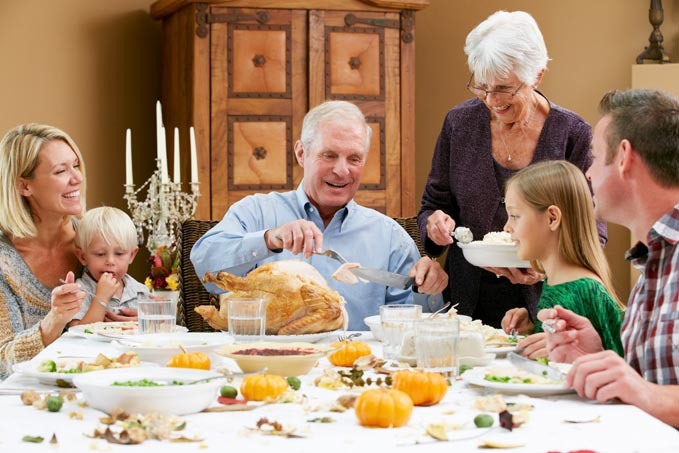 Remember to offer up some thanks to truck drivers who help to make this season so enjoyable for you and your family.